Now that the dust has settled on yet another feverishly passionate project, and as my career resumes its screeching halt status, it’s time to relive the glory that was “You’re Gonna Hate This”!!!! The show finally happened at Joe’s Pub this past Sunday night, and despite the box office computer’s being down for the entire weekend, not to mention springtime temperatures soaring to 41 degrees, we had a full, enthusiastic house. The band (Sean Driscoll and Matt Hinkley, guitars; Jay Mack, drums; Dan Fabricatore, bass; Jeff Roberts, percussion; and Michael Borth, piano, keyboards, and heroic musical direction) KILLED IT. Our director Dave Solomon managed to turn the whole thing into an actual, real live show, with some extra miracle-working help from our tireless producer Shoshana Feinstein, beautiful lighting design by KJ Hardy, and brilliantly animated title projections by Chris van Patten of Van Patten Media. The Joe’s Pub folks were terrific – professional and beyond efficient, they really took care of us in a big way. Oh, and we had a surprise 12-person choir at the end. And I learned how to tie a bow tie, just in time! All in all, a triumph. Naturally, Lindsay (Mendez or something, I think) was pure genius. Just hearing her singing the crap out of stuff I made up was mind-blowing for me – even though every time we sing together I can barely look at her for fear of cracking up, but that is only because I am a raging amateur by comparison and not to be trusted. (During one of her solo numbers I remember thinking, “This is going pretty well,” before promptly playing an M chord on the guitar; enough of that.) Before the show, while I was leaping around and pacing backstage as is my wont apparently, Lindsay admitted to feeling nervous, which surprised me: she could sit onstage and eat a chicken dinner and people would buy tickets, because she just has that thing. And had she not told me, I’d've never known, because she knocked everything out of the park, as usual. And then, seconds later (or so it seemed to me), it was all over. I got waylaid in the hallway and was unable to greet/thank a lot of people, so if you were there and I didn’t get to see you, thank you so much! If you weren’t, then perhaps you’re my agent, or most of the industry folks I invited (see screeching halt, above. Oh, well! ); maybe there’ll be another one some day. People did seem to like it. Many of them asked what the next step will be, and I have to say I’m just as curious as they are. Having lived and breathed this thing daily for the last five months, the sudden inertia has me crashing pretty hard, just as I knew it would, so I’m hoping this won’t have been its final appearance, despite what today may feel like. As with everything else on the Planet Earth, it’s pretty much out of my hands though, and that’s probably a good thing. A thing which I hate! 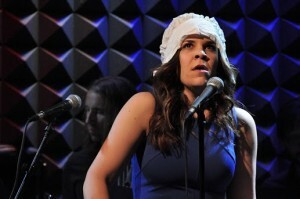 This entry was posted in Appearances, Blog, Music, Musicals, News and tagged blog, joe's pub, lindsay mendez, michael holland, NYC, shows, you're gonna hate this. Bookmark the permalink. 4 Responses to Hate To Tell Ya! raging, perhaps. amateur, oh please. This was so awesome. You and Lindsay were incredible together. I heard the M chord, and for some reason it worked. As did the bow tie. Congratulations to everyone involved. This was extraordinary. Another breath taking performance by two of my favorite people in the show biz! Nice to see old friends there, as well. Cannot wait to see where this goes! Congratulations! On both the show and the bow tie.